Move over marinara sauce, there’s a new sauce in town. The name is creamy pesto sauce. The game – being the best sauce for turkey meatballs. Once you try it you’ll agree. Happy Wednesday, friends! Can you believe we’re half-way through August already?!?! My birthday is this Friday, my mama’s is the following Tuesday, and then Baby Girl’s is the next Saturday. Yes, we have a lot of family birthdays in August. At least five others that I can think of off the top of my head. I still can’t wrap my head around the fact that she’s going to be one, already. How?!?! ?I’ll be off work next week to prep for her party, so that should be stressful good fun. I do love to party plan, but the perfectionist in me wants it all to be perfect and go off without a hitch. And then the logical part of me says, ha – yeah right! So, it’s always a bit of an internal struggle…hosting/coordinating events or holidays. But in the end, it’s totally worth it. 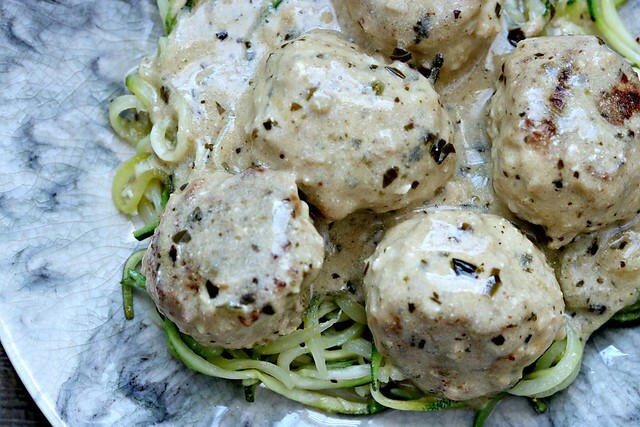 If it were practical, I would probably make these pesto turkey meatballs for her party. Why, you ask? Because Natalie loves turkey meatballs. Like, stuffs so much in her mouth her cheeks and lips poke out. And it doesn’t even matter what kind they are, but she especially loves this pesto variety. We quite literally have to stand right there in front of her and only give her a few pieces at a time, because she just can’t control herself. But an outdoor party with finger foods is not really saucy turkey meatball friendly. KnowwhatImean? Don’t worry though, I have a little stockpile of them in the freezer for her. I love turkey meatballs too, and I’ve made a good variety of them in the past. J loves pesto and turkey meatballs, so it’s a win all around. Oh, and served over zoodles instead of traditional pasta or rice is a nice change, as well. Marinara sauce is traditionally known and “the” sauce for meatballs, but this one right here is leaps and bounds above marinara. For me, anyway. Admittedly I’m not a huge marinara fan, but J loves it. 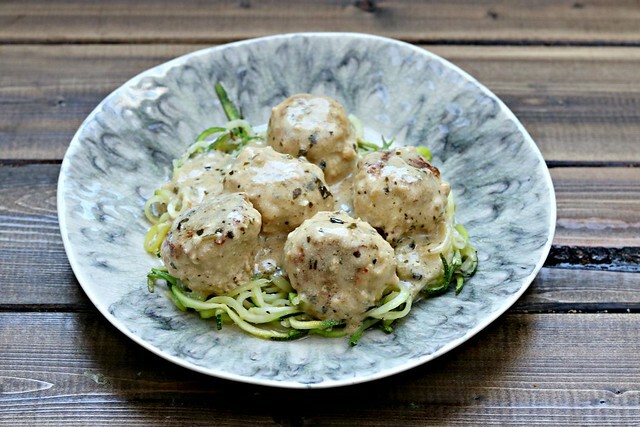 And I believe he’d choose this creamy pesto sauce over it, for these meatballs at least. Creamy turkey pesto meatballs are a great meal for the whole family, so get them on your menu right away! I promise, you won’t be disappointed. Move over marinara sauce, there's a new sauce in town. The name is creamy pesto sauce. The game - being the best sauce for turkey meatballs. Once you try it you'll agree. In a large bowl, combine the turkey, Parmesan, pesto, egg, breadcrumbs, garlic, salt, and pepper. Mix well (I find using my hands works most effectively) and then use a medium cookie scoop to form even sized meatballs. I scoop then shape in my hands and put on a large plate. Once all the meatballs are formed, heat butter and olive oil in a skillet over medium heat. Add the meatballs and cook for 2-3 minutes per side, or until golden and cooked through. Remove from skillet and set aside. In the same skillet, still over medium heat, add the minced garlic and cook about 30 seconds, until fragrant. Whisk in the sour cream until heated through. Whisk the cornstarch and water together to make a slurry, then add that along with the chicken broth, pesto, lemon juice salt and pepper and stir until well-combined. Lower heat and simmer 5-7 minutes until smooth and slightly thickened, stirring often. Add the meatballs back into the skillet, over medium heat again, and spoon the sauce over while the meatballs heat through for a couple of minutes. 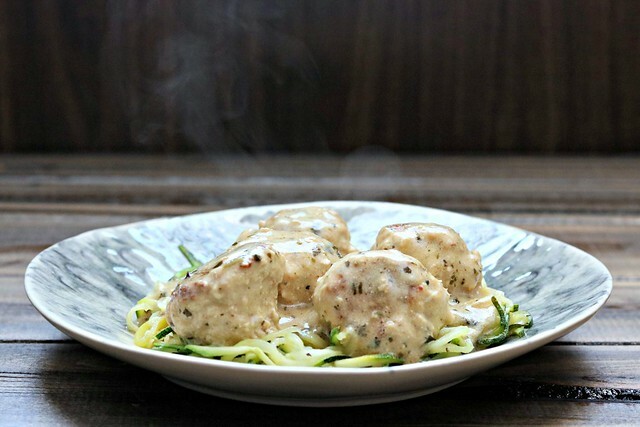 Serve with zoodles, your favorite pasta, or rice and plenty of that delicious sauce!